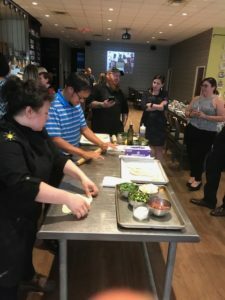 On May 30, members of Dallas Association of Young Lawyers learned how to make nutritious and delicious Margherita Flatbreads from the talented chefs and interns at local non-profit Café Momentum. The event was hosted by the DAYL Wellness Committee and curated by PSS attorney Nicole Karam and her committee co-chairs. Café Momentum’s CEO and Executive Chef Chad Houser, recently recognized as a “CNN Hero,” was on hand to supervise and socialize with the young professionals, who by all accounts enjoyed a terrific and meaningful evening. The DAYL Wellness Committeepromotes a “Healthy, Wealthy and Wise” mentality for young lawyers, and encourages a healthy balance between professional and personal life. Café Momentum proudly serves fresh, locally sourced, American cuisine in the heart of downtown Dallas. In addition to offering delicious meals in an incredible atmosphere, Café Momentum provides a transformative 12-month paid post-release internship program for young men and women coming out of juvenile facilities. For more information about Café Momentum’s important work, or to make a donation (or a dinner reservation! ), visit them here.